Did you know that when you get your small dog groomed, you are doing more than just making your pup “pretty”? In fact, you are helping your dog feel more comfortable and getting your dog groomed allows you to spot health problems before they become serious. If you get your dog regularly groomed, you’ll be able to look for lumps, injuries and bumps and any mats or ticks on your dog’s coat will be removed. You may even be able to detect cancer early enough and you’ll save your pups life. If you or your groomer find any questionable masses, be sure to reach out to your veterinarian right away. If you have long hair, then you know how painful it can be if your pony tail is pulling too tight. A mat feels the same way for a dog, since it’s a constant pull on the skin. An ungroomed coat can feel very uncomfortable. 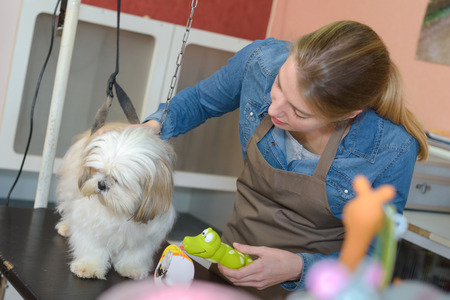 Getting your dog groomed on a regular basis, allows your pup to become accustomed to being touched. If you get in the habit of brushing your dog’s hair every night or every other night, it can relax you and your dog! Your pup will get acquainted with you more and more as you teach him to lie down as you give him attention and care. If you take a little time each month, your dog will pay you in loving and slobbery kisses! Here at Pauley’s Pups, we like to ensure that our breeds of small dogs are always looking and feeling their best. We have several professional pet grooming service recommendations for you. If you are searching for a new pup, be sure to check out our puppies for sale and give us a call at 804-798-7877 with any questions you have.